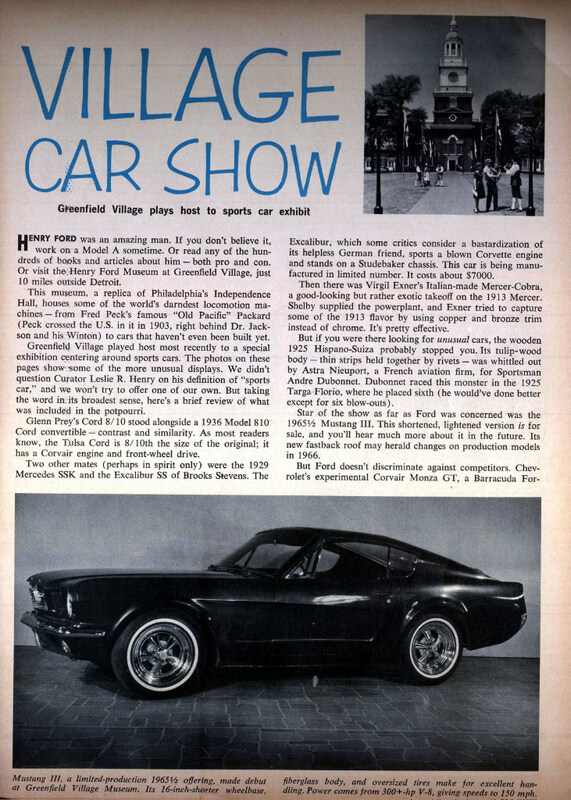 The first national exposure of the Mustang "Shorty" was the May 1965 Motor Trend article "Village Car Show" on a sports car exhibit at the Henry Ford Museum in Greenfield Village. Details follow with additional research findings. Ford gave the automobile the designation as a 1965 1/2 Mustang III for the Greenfield Village exhibition. 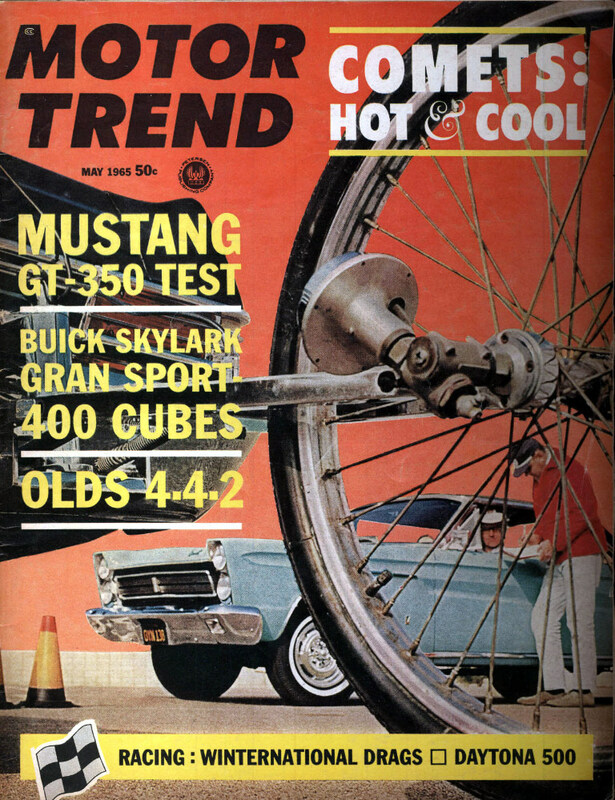 The Motor Trend article implied that the model might be available in 1966. It never was. According to a Ford Motor Company official that I spoke to today, the designation of "Mustang III" was used by Ford to described "Shorty" at this exhibit following the naming of the Mustang I prototype and the Mustang II prototype. Research also indicates that the chassis for "Shorty" was a 1963 Ford Mustang Allen Park Pilot Plant chassis 5S08F100009. According to early Mustang historian Bob Fria, it was "the ninth known pilot chassis scheduled to be built at Ford's pilot plant." 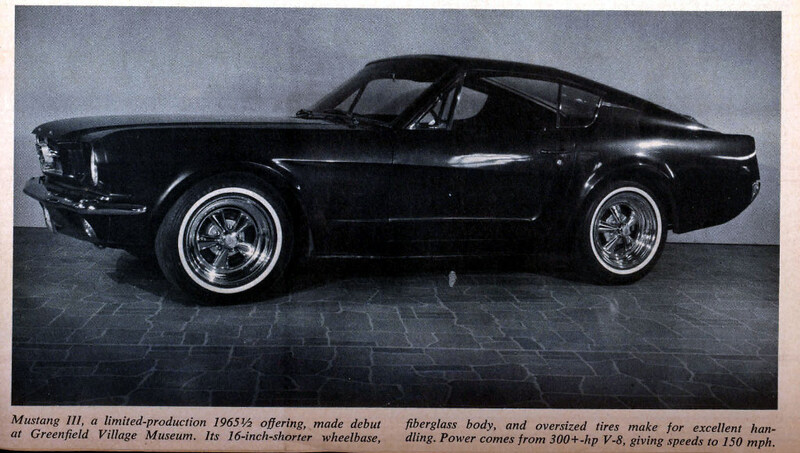 In Hemmings.com, Fria said: "that alone makes the car significant", given that his research shows that only 15 pilot Mustangs were built in November or December 1963 (all notchbacks or convertibles), and just three of those 15 are known to exist. "Mustang III, a limited-production 1965 1/2 offering, made debut at Greenfield Village Museum. Its 16-inch-shorter wheelbase, fiberglass body, and oversized tires make for excellent handling. Power come from 300+hp V-8, giving speeds to 150 mph". The "limited production" turned out to be one of one. Depending on the venue, "Shorty" has been designated either as a 1963 Mustang, a 1964 1/2 Mustang or a 1965 1/2 Mustang. Additional research will be needed to determine the most accurate description.